Quite simply, IQbuds™ are active earbuds. These tiny devices boast an enormous range of functionality that goes beyond what any other earbud manufacturer currently is offering. Unlike passive earbuds, our active earbuds combine intelligent hearing with noise cancellation, Bluetooth, voice recognition and more. Intelligent hearing, (i.e. the ability to control how you hear the world around you, such as hearing speech in noisy social settings) requires very complex audio Digital Signal Processing expertise, which our team has decades of experience in. With Bluetooth capability and no wires, Nuheara IQbuds™ enable clear, hands-free phone calling for your active lifestyle. No fumbling for your phone or the hassle of untangling earphone wires. Enjoy great stereo sound quality for music, podcasts, e-books, and other audio streams. Unique design and technology allows you to hear your favorite audio while either blocking or blending the sounds of the world around you. Enhance your listening experience with noise cancellation that suppresses or cancels out background noise using our sophisticated SINC™ (Super Intelligent Noise Cancellation) technology. 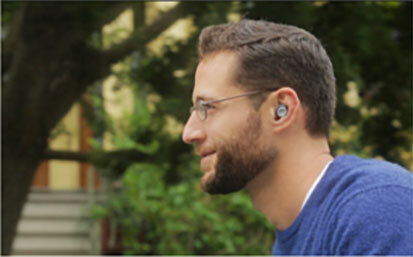 Multiple microphones and our intelligent processing technology enhance your hearing in challenging social settings. No more struggling to hear or avoiding noisy places for fear of not being able to hear and have easy conversations. Blend the sounds of the world around you with your digital audio streams by controlling the mix of both inputs through our active earbuds and phone application. Perfect for when you want situational awareness while also listening to your favorite music or audio stream. Control and save your favorite hearing settings based on location and preferences through our easy-to-use, customizable iOS and Android-compatible application. Extensive third-party industrial design has gone into the development of IQbuds™, purposely designed to fit most ears comfortably and securely and perfect for all day use. With a simple tap, you can answer phone calls, stop/start music and control what you want to hear in your physical and digital world. Small enough to fit in your pocket or purse, the carrying case provides safe storage and portable charging for an additional 12 hours of on-the-go charging. 4 hours of constant Bluetooth streaming with an additional 3 recharges from the carrying/charging case, offering 16 hours of on-the-go battery life.